These are some things my husband keeps saying to me. I get that I just had a miscarriage. But I’ve also never been one of those people who can just laze around. “Seriously, I’ll clean that,” Tom said, taking the roll of paper towels from me. He’s been great. I know he’s just looking out for me. I also want everyone to know that I appreciate your kind comments. I read them all. I am feeling better with each day. I do rest if I start to feel tired. Can someone explain what Beetle Juice is? And Silver Fox? I usually stick with what I know. Dreamsicle. What flavor would you go for? Never been a fan of Sno Cones...my teeth are really, really sensitive to cold. I have a hard time w/ice cream which is sinful b/c it's soooo good! Glad you're doing a little better, but taking it easy when you know you need to. I have a hard time lazing around too...it's just not in me. I'm glad you are feeling a little better, sno cones definitely help! I usually stick with bubble gum or the blue one.. I can't remember which flavor it is. I used to have a sno cone maker, but I left it at our old house which makes me rather sad. I'll take snocones. Any flavor will do. So glad you are feeling better. Tom sounds wonderful! I'm also so glad they delayed his deployment for you. Family first. BTW - ask for a taste of the crazy ones! You have a place that just has snowcones? How cool is that?! 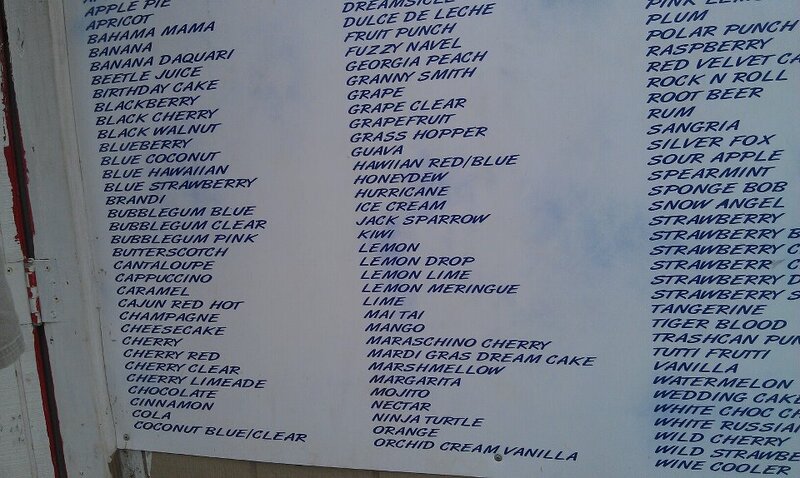 I want to know what some of those flavors are - like Jack Sparrow! Glad you are feeling a bit better. I don't know what Beetle Juice is but I would have to try it. My mom and Dad bought an old sno cone machine and restored it. It is SO much fun! They came and made sno cones for all the kids at Lil Duck's school on the last day. There is just something about them that uncovers even the deepest hidden smiles. Silver fox is so yummy! I son't really know how to describe it, but it's awesome. That is a LOT of flavours. Wonder if margarita comes with a shot of tequila. I have a sno cone machine in my kamp store! The hardest part was choosing which flavors to have on hand. My biggest seller is Tigers Blood. I call it a "Charlie Sheen". Tastes like a mixture of cherry and strawberry. I also opted to get the sour, with just a squirt I can make any flavor pucker your lips! Love sno cones! I usually get Tigers Blood. Have no clue what it is, and it sounds disgusting... lol But its yummy! What's a Ninja Turtle? I'd probably go with something with strawberry. I just read your previous post. I am so very sorry. I am sorry you didn't have a great ER experience. As an ER nurse I know how things should be, the doc should have spent some serious time with you. Hugs and loves. Hope you get feeling back to normal (whatever that is) soon. Take care of you and get some good rest. Root beer with marshmallow topping!!! I love trying new things but I adore Blue Hawaiian and Cherry Limeade! Why not ask them what's in the other flavors?? And try it! Snowcones are awesomesauce!!! Fuzzy navel has always been my fav!!!! So sorry for your and your husband's loss. I know it is difficult to deal with, (personally), and yes, it will help your husband to know he can help you. Quite a few years ago, when my oldest daughter was living in San Antonio, (we live in Bedford, TX now) my husband and I would visit them, and we went to the Alamo several times. There were Hispanic vendors there who sold snow cones, but called them "Razpas". We had quite a few of the Razpas because the temperature there in San Antonio was never below 85 or 90. HOT! My favorite cold treat though, is the Banana Popsicle. Yum! Glad you are feeling better. I love sno cones. Just about any flavor will do. 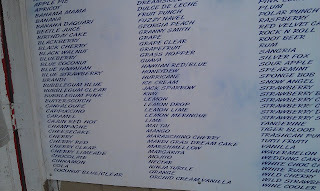 I think if that store was by me, I would start at the top and try ever flavor. Sno cones give me a headache. Sorry to read about the miscarriage. I hope you are all doing well. Silverfox is almond or almond vanilla, I can't remember, but it's good. Beetle Juice I'm not sure about. Try Tiger's Blood or Tutti Frutti. You can add two flavors like chocolate and coffee together. Whenever I had it in New Orleans (the birthplace of Sno Cones) I always have ice cream in the middle but the locals say the right way is condensed milk. If you like dreamsicles try it as a sno cone with condensed milk.